The yellowing of what should be healthy and nicely green leaves on any plant may be a sign that something is not right. 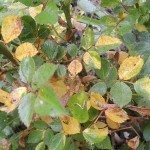 The yellowing of the leaves on a Knock Out rose bush can be one of the ways of telling us something is not right with its health and well-being. It can also be a normal occurrence that is part of the cycle of life for the bush. We need to check things out to determine which signal the rose is sending us. What Makes Rose Leaves Turn Yellow? One of the first things to check when noticing yellow Knock Out rose leaves is the soil’s moisture. Perhaps, it has been raining for several days or even off and on with misty or foggy conditions for multiple days. The lack of good sunshine and lots of water can indeed spell trouble. The rainwater saturates the soil, not allowing oxygen to move through and causing water to hang around the root zone too long. This will lead to the Knock Out rose leaves turning yellow. Additionally, it is tough for proper photosynthesis to occur without some good sunshine. Other things that can cause yellowing of the leaves have to do with nutrients not being readily available, such as nitrogen. Using a good well-balanced rose fertilizer is highly recommended. Be careful not to use fertilizer mixes that are extremely high in nitrogen though, as too much nitrogen will lead to an abundance of that nice green foliage and few, if any, blooms. I like to give the bushes some alfalfa meal and kelp meal, as these items help build the soil with good nutrients. The soil’s pH level being out of whack can also cause the yellowing of leaves, so checking this is another item on our checklist if a problem starts. Checking the soil pH a couple times a season is not a bad idea as a general rule. Insects that are attacking the rose bushes can make Knock Out roses have yellow leaves, especially if a spider mite is sucking the life-giving juices from them. Be sure to turn the leaves over from time to time while out tending the garden so you can find an insect or mite problem starting. Catching such a problem early on goes a long way to gaining control, thus stopping larger and more difficult problems later. Some folks will tell you to use a good systemic spray or granular application of products for general disease control (fungicide, insecticide & miticide) to address all these possible issues. I would not use such a method unless the situation is way out of control and a drastic measure is needed to get things back on track. Even then, use only enough applications to handle the given situation, as too many can damage the soil and many of the soil borne organisms that help keep the roses healthy are destroyed. 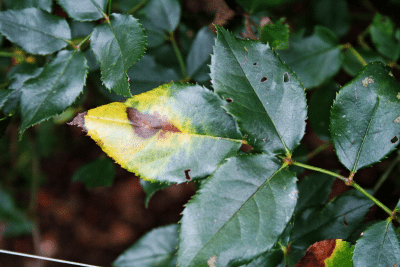 Fungal attacks can lead to Knock Out rose leaves turning yellow too. Fungal attacks will usually give other signs before the yellowing, such as little black spots on the foliage with perhaps a yellowing circle around the black spot (black spot fungus). Sometimes a white powdery looking substance starts to cover the foliage, wrinkling up the foliage (powdery mildew). These issues can be avoided by spraying with a good fungicide of choice. Using the least toxic product that will provide the necessary control is highly recommended. There are some very good “earth friendly” products available for a preventative spray cycle application. In wet conditions, some fungi can become very stout foes and a stronger fungicide is in order. Hot and cold weather changes will also bring about the yellowing of leaves, as the rose bush can be stressed out. Giving the plant some water with Super Thrive mixed into it can help relieve such stresses, as well as transplanting shock and stress. If your Knock Out rose turned yellow along with falling off of some leaves, this can be a normal cycle of life as well. 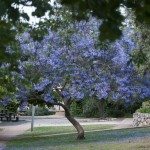 This is usually lower foliage that is shaded by dense new upper foliage. The lower foliage being shaded is no longer able to catch the sun’s rays nor is it as able to take in nutrients, thus the bush sheds the leaves. Foliage that has become extremely thick can bring about the yellowing for a couple reasons. One is that the thick foliage causes the same shading effect mentioned previously. Another is that the thick foliage limits good air flow. When the weather turns very hot, the bush needs the air circulation to help keep it cool. If the foliage is too thick, it will drop some leaves to create air space in an effort to keep cooler. This is part of the heat stress reaction by the bush. 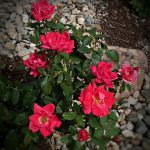 Keep a good eye on your rose bushes and check things out well when a problem is first noticed, and it will go a long way towards enjoyment rather than frustration. Read more articles about Knock Out Roses.